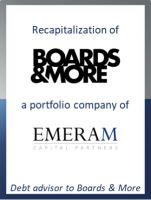 Gregor König, CFO at Boards & More, said: "We are delighted to have completed a fast and efficient financing process at the end of which we received a financing solution that perfectly fits our operational needs and growth strategy." Thorsten Weber, Director at GCA Altium, added: "Boards & More’s outstanding performance over the last years allowed us to run a competitive financing process and test several potential refinancing options. We finally decided on a financing that reflects the company’s current and future growth ambitions and allows maximum flexibility."